Think of the things that make our world a hard and dark place. What comes to mind? A short list might include: death, injustice, poverty, racism, oppression, war, hatred, disease, and self-righteousness. Can you imagine a world where these causes of misery have been removed? There would be: life instead of death, justice instead of injustice, prosperity instead of poverty, unity instead of racism, freedom instead of oppression, peace instead of war, health instead of disease, and humility instead of self-righteousness. It sounds too good to be true. But it is true. This broken world is going to be totally restored by the coming of the Kingdom of God to earth. All causes of misery, struggle, and sadness will be removed and people will live in perfect harmony with one another, and also with God. The world will be filled with love and joy. Nobody will get angry, depressed, or worried. Nobody will get sick, contract diseases, or suffer pain. Nobody will feel empty, lost, or unloved. When the Kingdom of God comes in full, it will be heaven on earth. Forever. This vision will come to fruition when God’s chosen King, the Christ, Jesus of Nazareth, returns to make all things new (Revelation 21:5) by establishing the Kingdom of God powerfully and permanently on earth (Daniel 7:13-14). Until then, we get glimpses of heaven on earth as God works in and through ordinary people who have chosen to bow to Jesus as their Lord and Savior. Such people, like the world, are going to be completely made new when Jesus returns. But, even now, they are experiencing the transforming grace of God as disciples of Jesus Christ. Christians, as we are called, are not bringing God’s Kingdom to earth, we are receiving it (Hebrews 12:28) by faith. But we are not idle. We have been given a great commission, a tremendous task, a majestic mission. After the King of kings, Jesus Christ, died on the cross to pay for the sins of His people, was buried in a tomb for three days, and then triumphantly rose from the grave to prove He had conquered sin and death, He spent time with His disciples teaching about the Kingdom of God (Acts 1:3). During that time, He gave them what we call “the Great Commission.” He said, “All authority on heaven and on earth has been given to me. Go, therefore, and make disciples of all nations, baptizing them in the name of the Father, and of the Son, and of the Holy Spirit, teaching them to observe (obey) all that I have commanded you. And behold, I am with you always, to the end of the age” (Matthew 28:18-20). The mission, therefore, of disciples of Jesus Christ is to make more disciples of Jesus Christ in all places, all over the world. When disciples have been made in every country and from every ethnic group, the end will come (Matthew 24:14). In other words, when Jesus’ disciples complete the Great Commission, He will return to make all things new (see Vision: Heaven on Earth, above). The disciples of Jesus Christ are organized and mobilized in groups (of varying size), under ordained leadership, in what we call the church. University Presbyterian Church, therefore, exists to make, mature, and multiply disciples. We exist to make the greatest contribution to the completion of the Great Commission as we possibly can. We believe we accomplish our mission by living The Cross-Shaped Life. Before Jesus died on the cross to redeem God’s people, He spent three years making disciples. When He gave the church the Great Commission, therefore, He had already shown them what to do. All of the Gospels (Matthew, Mark, Luke, & John) reveal Jesus’s disciple-making activity. Here we will look at the Gospel of Mark. It’s really quite simple. 3. Jesus preached (proclaimed) the gospel and demonstrated the in-breaking of the Kingdom of God repeatedly. And he went up on the mountain and called to him those whom he desired, and they came to him. And he appointed twelve (whom he also named apostles) so that they might be with him and he might send them out to preach and have authority to cast out demons. Jesus made disciples by being with them and sending them out to do the same things He had been doing. In the same way Jesus had been preaching (proclaiming) and casting out demons (demonstrating) the gospel, His disciples – having been with Him for training – were to go and do the same. In Mark 6:12-13, it says that when Jesus sent the original twelve disciples, “they went out and proclaimed that people should repent. And they cast out many demons and anointed with oil many who were sick and healed them.” Once again, they went to proclaim and demonstrate the gospel and the Kingdom of God. When Jesus called disciples, He told them He would make them become “fishers of men.” They might not have completely understood what He meant, but it was clear He was going to transform their lives. It wasn’t long before they had been transformed (although not entirely), and they had become like Jesus. They were proclaiming and demonstrating. Jesus, who was mighty in word and deed, had multiplied Himself. So, when He gave the disciples the Great Commission, they knew just what to do. Having been transformed by Jesus, they set out to proclaim and demonstrate the gospel in order to multiply themselves in every place and people group on the planet. These are the four things we focus on at UPC. This is the Cross-Shaped Life. We call it that, because we believe this is how we ought to live if our lives are to be shaped by what Jesus has done on the cross. 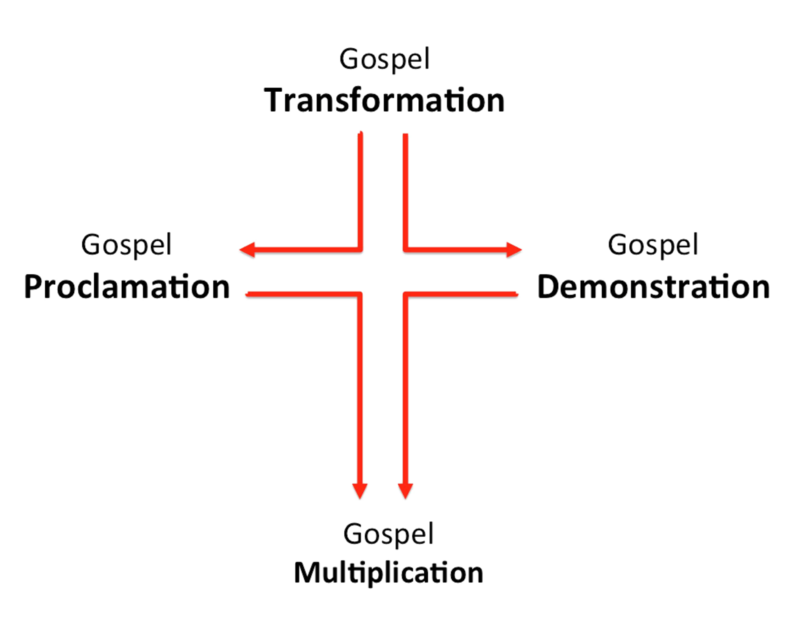 And, because of the way Gospel Transformation leads to Gospel Proclamation & Demonstration, which leads to Gospel Multiplication. Join us! If you do, your life will change. You’ll be made into something new. And you’ll play a role in preparing the world for the return of King Jesus who will make all things new and rule and reign forever and ever. Come be a part of the greatest imaginable life, and look forward to a future beyond imagination! Join us for worship at 9:00 a.m. and 10:45 a.m.